Trying to find the best rugged laptop that suits all your needs can be confusing. We’re spoilt for choice these days when it comes to laptops. It’s fair to say that, for most people and general office use, any modern laptop will get the job done, but there’s no one-size-fits-all device when choosing a rugged laptop. All rugged laptops pass military grade standards (MIL-STD-810) and work in extreme conditions but your work may require extra features. When choosing the best rugged laptop for your work, you need to delve deeper into the specs to understand what works best for you. This post will help you find the best rugged laptops available in Australia in 2019. The Panasonic Toughbook CF-33 MK1 is a two-in-one rugged laptop and tablet. 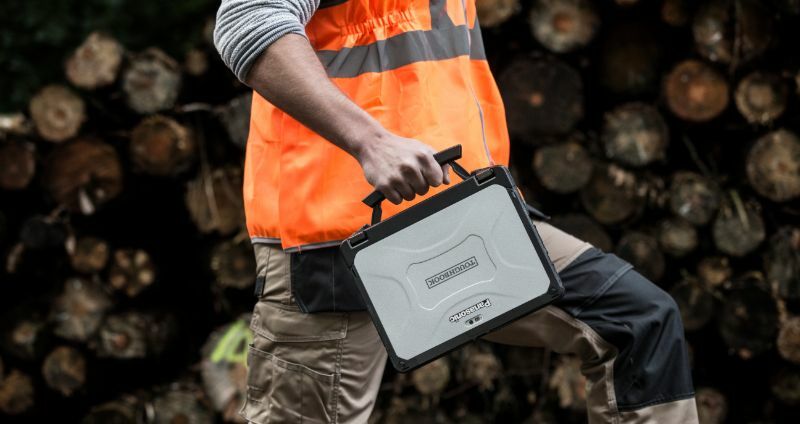 This Toughbook is suited to people who work outdoors. It’s the first of its kind with a 1,200 Nit screen, making it one of the most visible rugged laptop screens on the market. For comparison, most regular laptops only have approximately 300-Nit displays. The Toughbook CF-33 has an Intel Core i5-7300U vPro Processor that makes this rugged laptop capable of more demanding tasks. The Getac V110 is a powerful, rugged laptop with an Intel Core i5 processor, 16GB of RAM and the durability of a Nokia 3310! This rugged laptop is a compact design and can also detatch to operate solely as a tablet. Drops, dust and extreme weather are no match for this machine. The Getac v110 is a rugged laptop that offers more portability than most rugged laptops. The laptop measures 11.7 inches by 8.78 inches and is 1.34 inches deep. The v110 is ultra lightweight and weights less than 2kg. The Panasonic Toughbook CF-54 MK3 is a semi-rugged laptop that's designed to withstand extreme wear and tear and damage. It boasts the title of being the thinnest (1.2 inches) and lightest (2kg) 14” semi-rugged laptop on the market today. This semi-rugged laptop is lighter than other rugged laptops on the market and suits those who require portability in their job. The Toughbook CF 54comes with a retractable handle to allow for quick and easy transportation between different locations. When choosing a laptop, think about the most important tasks you need to complete on a daily basis. For example, if you work outside and always struggle with glare from the sun then the Panasonic Toughbook CF-33 is the best rugged laptop available because of its powerful 1,200-Nit screen. None of these rugged devices will let you down in the field but choosing the best laptop for your work can make your job easier. All of these come with hot swappable batteries but consider battery life and how long you will be using the laptop for in a regular work day. If you need any advice on rugged laptops, don’t hesitate to ask one of the experts at Roaming Tech by calling 1300 131 933 or contact us online.